"Headline News lasts for a day, but Noteworthy News becomes history." This is why some of our articles remain. -- Internet Newspaper Editor. The Webb Community Center said "NO Parking Lot!" The Minority Community of Hot Springs, Arkansas expressed their unanimous opposition to the sale of it's Webb Community Center, at the town meeting last night. The oldest and only remaining privately held facility for African American cultural and social heritage has been in operation for over ninety (90) years. The City of Hot Springs entered into negotiations with the center's current administration for purchase of the building, grounds, and swimming complex, offering $61,000, in an effort to acquire additional parking space for it's new convention auditorium. The cost of the New Convention Center is $34 million dollars, not including parking lots or a new 4 lane highway that could destroy more of the historic buildings of Hot Springs, Arkansas. Let's increase the 'Hamburger Tax' , Hot Springs City increased the taxes by 16.66% on hamburgers, cokes, fries, and other fast foods that are prepared in the city. So, bring your own lunch, and enjoy the hot springs. "$34,000,000 Dollar Bond Issue - New Hot Springs Convention Center." Feasibility study is demanded - Arkansas State Highway and Transportation Department has agreed to study the heavy truck traffic downtown; BUT the study needs to include the traffic problems that will be created by a new Convention Center. The issue surfaced to the top when city Fire Marshall Ed Davis was injured by falling bricks in a burned-out building downtown. Mr. Bill Goodwin said he believes the bricks were shaken loose by the rumbling of heavy trucks and he worries about the effect of constant vibrations on the historic buildings downtown. If the feasibility study overlooks the traffic problems slated by the new Convention Center, the bonds may become worthless and the city deep in debt. Is this what we will leave the next generation? The federal government is broke, and now will Hot Springs be bankrupt too? "MAGIC SPRINGS" Fun Park - Closed! 500 summer jobs lost, $7,000,000 dollars of lost revenue in tourism trade. Crime may increase this summer with no place for the kids to play. The Advertising and Promotion Commission spent over $4,000,000 last year to tell the world to come to Hot Springs, then they will not help this company. No wonder the tourism trade is sharply down. Local hotel manager tells the world that they will send the tourists to other towns because of the Advertising and Promotion Commission changing their policy on the use of the LOGO. When this reporter questioned the contract that is dated from May 1995 to May 1999, A&P Director Don Raulie said, "I didn't approve it, I gave verbal approval." When asked for the original contract; the A&P said this copy is the only paper they have. This is the second time that they have destroyed government documents or lost them. We had WATERGATE; then WHITEWATER; but now HOT LOGO WATER, the Advertising and Promotion Commission should be investigated. 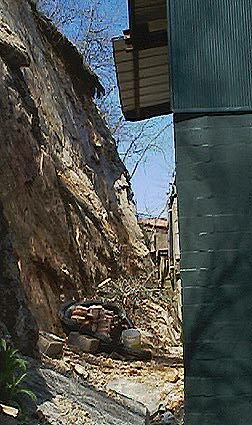 Trucks are shaking the buildings in the downtown area of Hot Springs - may cause the hillside to cave in. New alternative route - finish building the bypass around Hot Springs. State Geologist has always said that Hot Springs Area is unstable - A 31 year old woman was killed after being trapped under bricks and other debris when the falling rock came crashing down into a Downtown Hot Springs building owned by Kenneth Wheatley III. 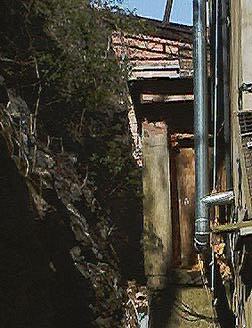 Cliff behind store where one person died. 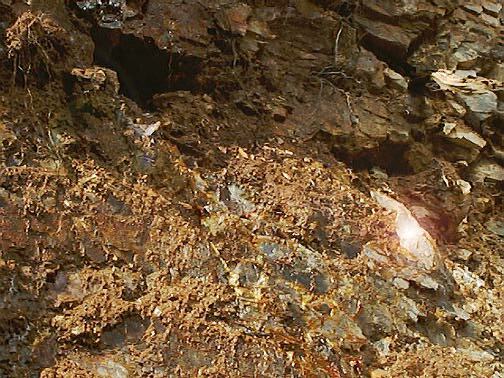 Crystals holding up cliff side - VERY dangerous, do NOT dig! Is Hot Springs burning down? - businesses destroyed in FIRE. 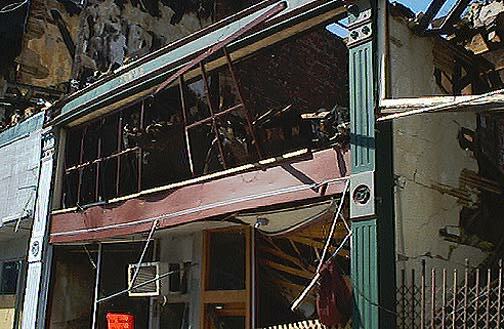 Goodwin's Gift and Gallery - Suffered extensive smoke and water damage. 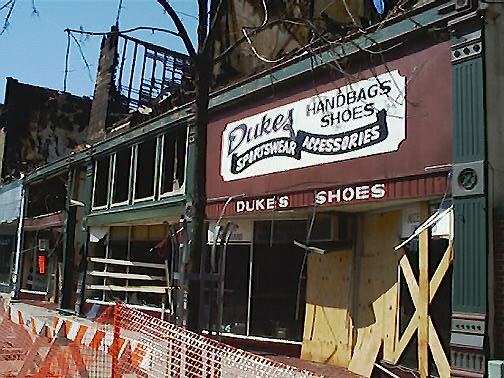 The local resident that reported the fire claims that the smoke started in Duke's Shoe Store, not at Magee's Cafe. Is the investigation looking in the wrong places?